The Brussels Droh!me Golf Club has been awarded golf’s global eco-label, GEO Certified® in recognition of our commitment to nature protection, resource efficiency and community value. As many of you know, the Brussels Droh!me Golf is located in an protected area “Natura 2000”. Some very old trees located on the course and the beautiful forest and the unique buildings make this golf course a very special place. The Brussels Droh!me Golf Club, and Droh!me are very aware of this unique location and we have shown ourselves true to the original values of natural golf, by ensuring efficient and sustainable management benefits to the landscape, providing habitat for local biodiversity, and a healthy recreational space for the community. Everybody who works at the Brussels Droh!me Golf Club and Droh!me is very lucky to work and look after this beautiful environment and we have a duty to do so in a way which protects it not only for now but for the future as well. 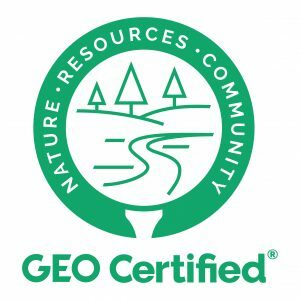 GEO Certified® is a global accreditation, assessed by an independent verifier and administered by GEO (the Golf Environment Organization) an international not-for-profit dedicated to supporting the golf industry to drive forward sustainability within the sport. Some of your club’s achievements highlighted in the independent verifier’s report include the fact that our club doesn’t use any pesticides for the maintenance. Droh!me has also invested in new machines that are either hybrids or electrics. Also the irrigation system has been replaced to consume less water to irrigate the greens. Concerning our relationship with the local community, we try to work as much as possible with local suppliers, working with local schools and we organize golf lessons for a minimum price, so that everyone can try this fantastic sport. For the future the Brussels Droh!me Golf Club and Droh!me will continue to work hard to keep his label. Many actions are planned for this, among them for example the installation of a washing of filling station for the machines, using rainwater and a closed system. We hope that all the players and visitors will help us with our goals and I hope sincerely that you appreciate the beautiful golf course and his environment even more! !